Cork flooring has been part of the construction scene for over 100 years, and is making a comeback. It has a very different look and feel from ceramic tiles, hardwood, stone, or carpeting, and is worth looking into for your next floor. Cork isn’t just for wine bottles any more! Cork makes a great foor too. Cork has been used in a variety of ways for thousands of years, and flooring has been on the list of cork uses since the late 1800s. Related Reading: Check out our best reviews and comparisons of floor tiles made from cork! Including buyer’s guide! Cork is the outer bark layer of the cork oak tree. Cork consists of a tight web of up to 40 million cells per cubic centimeter, cells that retain gas and give cork its unique character. These trees are found growing in Mediterranean climates like Portugal, Spain, southern France, Italy, and the Maghreb region of north-western Africa. Cork is considered environmentally friendly and sustainable; not only does cork regrow, but also it is readily recycled and biodegradable. Cork flooring’s two styles are tiles and planks, and it comes in a range of natural colors. Tiles are glued down and planks are generally floated. Cork tiles are solid cork, about 1/4″ think and are usually 12″x12″ or 12″x24″, with a veneer of decorative cork on top. Cork planks are a sandwich, the layers being cork, a solid center core, cork, and a decorative cork veneer. The solid core is typically made of a fiberboard like HDF (high density fiberboard). The plank dimensions are about 1/2-5/8″ thick, and a nominal 1 foot wide by 3 feet long. 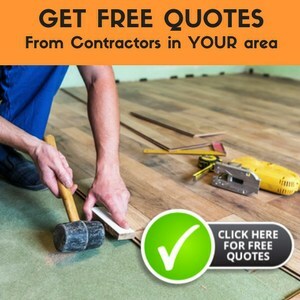 Tiles are typically glued directly to the subfloor or concrete slab, while planks are clicked or glued together but floating on the subfloor. The hardness of cork is rarely discussed because it is so different from wood and laminate flooring materials. Its Janka rating is 200, but that doesn’t accurately reflect its durability. Its softness seemed like a problem when I dropped a wood sample on it, and the corner of the sample cut into the flooring. I went to show our flooring installer the cut a few months later and couldn’t find it; the wound had “healed” without a trace. Cork has been around for thousands of years. It has been used for floats for fishing nets, stoppers for wine and olive oil bottles, sandals, insulation on boats, and even roofing in northern Africa. As a flooring material, it has been used for over a hundred years in buildings like churches, private homes, courthouses, health clinics, libraries and banks. Cork flooring has recently made a comeback, and it’s being used in a wide range of buildings, including restaurants, bars, showrooms, as well as private homes. From personal experience, I see the cons of cork flooring being in the new approaches to finishing the product. The floating cork floor we put in our house has a finish that streaks when damp mopped, has attained a dull finish, and scratches easily. The finish hasn’t kept the cork bits from flaking out of the tile, even in low-traffic areas. I frankly blame that on the finish rather than the concept of cork flooring. I haven’t tested this yet, but I wonder if a urethane finish would not only improve the existing finish, but also seal the seams that don’t seem to bet as impervious to moisture as advertised. Cork flooring has the most abundant list of benefits I have ever seen or experienced. It is such a delight to walk on, adding a spring to your step, and it muffles sounds, like carpeting does. Its hard surface keeps allergens from hiding, so cleaning is easy and reduces allergy problems. It is beautiful to look at, partially because of its lack of grain and directional growth. Because of its insulation quality, cork mutes sound transfer between floors, and maintains a reasonable temperature range. If you are striving for a “green home”, take note because it qualifies for points under LEED (Leadership in Energy and Environmental Design, a green building rating system developed in the U.S. by the Green Building Council); that’s a huge statement of support for the sustainable aspects of cork. If you are looking for an elegant flooring that is durable, comfortable, easy to maintain, and has a unique look to it, then cork is the right choice for you. When you choose a cork floor, you are choosing to have a floor that will last several lifetimes. What a great choice! I just purchased a condo and all 2 and 3 floor units are not allowed to have anything but carpet in them. I am trying to do 2 things. 1) prove that cork is not the same as harwood and 2) find information regarding the soundproofing of cork. I have been told that only carpet can offer the soundproofing the board will find acceptable, but I am sure there are insulation products out their that will work as a sound barrier. Do you have any recommendations as to where to start looking for information? When I had cork floors I couldn’t hear anything upstairs, be it conversations or footsteps. Now that I have bamboo I can hear bits of both. If a floating cork floor is used there are 2 layers of cork to muffle sounds, plus the inner layer of HDF or some such material. And if you really want to add even more soundproofing a cork underlayment could be added. That combo would probably be more soundproof than any carpet & padding. Then if runners & area rugs are used, & it’s a shoe-free house the condo will be very quiet & healthy. One point to make: check appliance height to make sure problems aren’t created – but then it’s rare to have carpet in appliance areas, so the cork underlayment wouldn’t be needed; I’m esp thinking of dishwasher. I have some cork flooring in my kitchen. I hear that cork has to breathe. There are some thoughts on discoloring also. What type of area rug would you suggest to go on top of cork laminate floor? Also i have gouged the surface 1/8th inch. Is there a way to fix or seal this? Thanks. I am not aware that cork has to breathe, but I am sure that it is possible to become stained or damaged as any other floor. For an area rug, I would choose one that does not have a rubber backing that could stick to the laminate. You should be able to find a correct sealer for nicks and scratches in cork laminate flooring. Then just follow the directions on the product. We are moving into an apartment with cork flooring. The problem is that we have a lot of antique furniture mounted on small wheels that will dent and/or scratch the cork. Also, I fall down a lot and I think the cork would not be as soft as carpet! ( duh!) Can carpeting be installed over a cork flooring? Cork is a soft material, but probably not as soft for falls as carpet. Yes, you can install carpet over the cork. To preserve the cork, you would want to avoid gluing the carpet to it. Hi, my question involves the installation of cork flooring in a heavily used family room (room also used as an informal dining room most days) by a very casual (but very busy) floor-dwelling, homeschooling family. However, we also are a very animal-rich family, and deal regularly with large dogs, multiple cats, multiple aquariums, and of course the occasional “accidents”, messes and spills that involve any number of those animals (or kids!) and the floor below their feet. The family room is on the lowest part of the main floor (gets very cold in Michigan’s winters!!) and has a cement slab base with multiple levels of plywood and insulation. On one side of the family room is a small cement-slab entry in front of the back door. On the other side of the family room is a cement slab hallway leading to the front door. We will most likely just drop down some vinyl tiles or something in the hallway & entry way. The main issue is this – I desperately do not want to put carpet back in this family room (what a nightmare with our family/lifestyle) but my husband and kids, understandably aren’t real keen on any type of “hard” flooring (tile, vinyl, etc). We have moved out of our home for a couple weeks to have the rest of the house’s hardwood floors refinished, but now need to make a final decision on the family room floor, as well as the upstairs bathroom floor. As much as I don’t want carpet, I really REALLY don’t want to have to move our chaos back out a year or so from now to replace a flooring that didn’t hold up. I’ve seen so much conflicting information on cork flooring in regards to water, kids, pets/nails, stains, scratches, etc. but most negatives seem to directly relate to the engineered planks, a lack of proper sealant, and/or improper installation in the first place. I’d love to know what you think the true reliability of cork flooring is (assuming it’s installed properly and sealed extremely well). Would installing pure cork tiles (or even the eng.cork planks) be a set-up for failure? Should I resign myself once again to installing (*gulp*) carpet..? I should also add that aside from the noise-suppression, floor temperature on bare feet, and ease of cleaning benefits, the health & air quality benefits, positive environmental impact, and pest resistance are all hugely important to me personally. We aren’t picky with appearances at all (could care less if you can SEE scratches, faded sections or whatever), the only concern for our family in particular is how it will actually hold up to a high-contact lifestyle. Scratches are fine, but if the scratches turn into gashes which turn into gaping holes that absorb water and such, well obviously that’s going to be a problem! I guess I’m looking strictly for a durability report, not a “how well the color holds up” kind of report. Hope that helps. My personal experience with cork flooring is in the article above, I did have some problems with scratches going into the cork, but believe it was related to the sealer. I would be sure that if you decide to use it, that it is well sealed. But, any hard floor will be easier to maintain and clean than carpet, with all the activity described. We moved into our condo which has cork flooring pretty much throughout. In our kitchen, we bought a 2′ x 8′ black rubber mat to put along the standing/cooking area in front of the stove, etc. Well, what happened is the cork is now seriously discolored (actually it’s a pretty cool color, just obviously different from the existing cork). So my question is this: I want to take the cork out of the kitchen and put down tile but we have the floating planks. I will need to cut the floor at the entrance to the kitchen to start installing tile. Will that work? I don’t want to cut and have them loose, etc. Yes, cutting the cork at the entrance should work. There are “T” strips/joints used to join two surfaces that will keep the raw edge of the cork from getting nicked. You can use wood or metal. One more thing to mention – rubber backed mats can cause discoloration in tile also. It is always good to check with the manufacturer of the flooring when choosing a rug to use. Hi Flooring Lady, We recently installed cork almost throughout our house. We love it!! I have a question – we are putting an area run underr our dining room table that has jute backing (the scratchy backside of the carpet). My question is, should we use a non slip carpet gripper (looks kind of like rubber shelf liner with holes in it). We don’t want to mess up our beautiful cork!